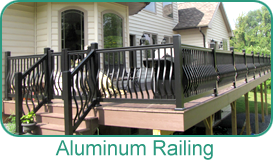 Nothing accessorizes a fantastic deck like a complimentary railing system! 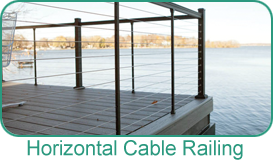 Modern, Contemporary, Victorian or Traditional, Holbrook has the Railings to add style and functionality to any deck or porch project. 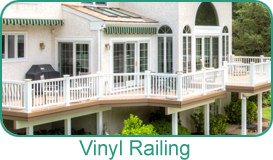 Create an evening oasis by adding Led powered Low Voltage lighting to you railing, fence and deck. 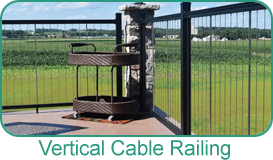 As a design element railings have come to the forefront in recent years and serve as much more than a utilitarian purpose. 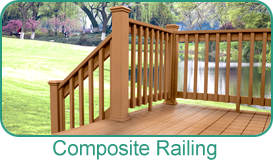 Holbrook Lumber stocks a multitude of railings in vinyl and aluminum, cable railing in both horizontal and vertical and all of the accessories and colors to bring your Deck and Railing project to life! 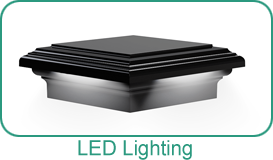 Creating an after sundown ambiance outdoors is easy with Placid Point Low Voltage LED lighting. We have colors to match our aluminum and vinyl railings and installationis easy with our Plug and Play wiring system and Multi-function Control Hub.